Communities caring for catchments. Connecting local communities with waterways and catchment management. Waterwatch is a citizen science program for monitoring waterway health. Do you know how healthy your local waterway is? Find out about the water quality data, surveys and observations collected on your local waterway. School programs and volunteer monitors build their skills and knowledge by participating in Waterwatch. Find out what water quality data, photos and observations are being collected on your local waterway. Understand how we use water quality assessments to measure waterway health. Saltwatch is an environmental monitoring program that helps communities understand the salinity problem in our waterways. Citizen scientists are people who want to make a difference to the environment and their community. View photos contributed by community members passionate about their local waterway. If you have you an image to share visit our Instagram site. There are many different ways that you can volunteer your time, energy and enthusiasm with Waterwatch, and the program welcomes all new volunteers. Keep up to date on all the latest Waterwatch News. The Waterwatch and EstuaryWatch programs host community events throughout the year. Check out our calendar of events to see what’s on near you. 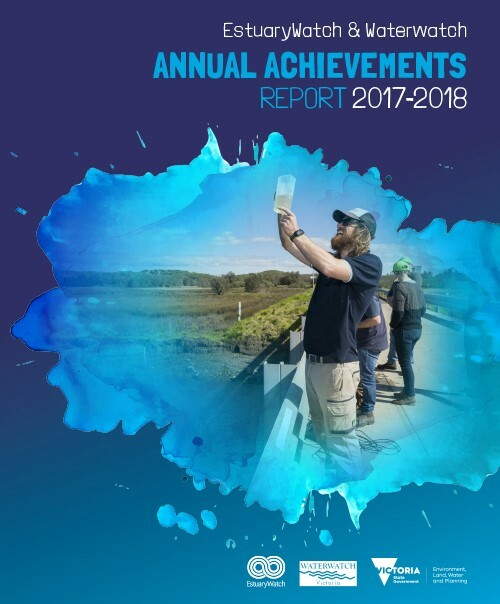 Each year, Waterwatch and EstuaryWatch programs produce an Annual Achievements Report. Access the reports. Access Waterwatch manuals, reports, strategies, yearbooks and other useful resources here. Victorian landscapes contain a mosaic of waterways. Freshwater is an essential link providing water for our community needs and maintaining natural ecosystems. Read reports analysing water quality data and discussing their implications. Education programs like River Detectives study water issues, explore principles of ecosystem function, and promote sustainable living practices and behaviours. During Saltwatch Week each year, schools from all over Victoria can learn about the effects of salinity on water quality in their local catchment. Water quality monitoring plays an important role in evaluating the condition of Victorian waterways.